Found 2 file extension associations related to Bloodrayne and 2 file formats developed specifically for use with Bloodrayne. The game begins in 1932, in a place where it appears that the people believe in vampires, as all the doors and windows show crosses. It shows two people (male and female), running down a street. The woman trips, and the man pauses long enough to help her up, only to be dragged into a dark alleyway by a chain. His head is thrown from an alley at the women's feet, with Rayne walking calmly up to the woman. The woman seemingly breaks down crying, but in fact only hides her face to reveal she is in fact a vampire. After a brief fight, Rayne decapitates her and then takes off before a small army of vampires tries to catch her off guard. She drops a grenade on their position as she leaves. On top of the buildings, two mysterious men, who were watching the events unfold the whole time, are discussing their reason for being here. One reveals they are here to recruit Rayne, who is trying to find where her father is. The other member does not want a Dhampir with the Brimstone society, regardless of the fact that she is only half-vampire and has fewer weaknesses, as the Society is trying to rid the world of Vampires (and presumably people with Vampire blood in them). 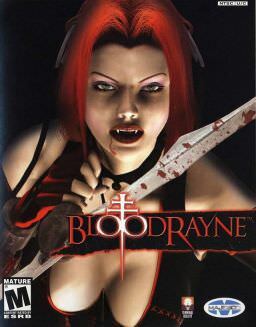 Eventually they agree to recruit Rayne, and leave a necklace with their symbol on it (as seen on the game cover). If you need more information please contact the developers of Bloodrayne (Terminal Reality), or check out their product website.